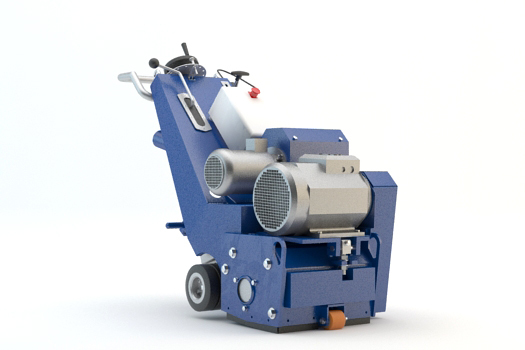 The Blastrac BMC-335EHY is a heavy duty shaving and sawing machine ideally suited for large applications. The BMC-335EHY is a versatile machine, by changing the pulley’s the machine can also be used as a standard scarifying machine. It's increased weight allows it to generate more efficient shaving and scarifying action. With variable speed, forward and reverse, this heavy-weight performer can be driven without the scarifying drum engaged. The BMC-335EHY shaver is almost dust free when connected to the appropriate Blastrac dust collection system. Blastrac has designed a full range of sawing blades and scarifying cutters, which give the opportunity to process any floor and specific application.. Utilize different blades for varying applications on surfaces such as concrete, stone, or asphalt.